Welcome to Cochenille Specials! We currently have no specials available. Be sure to visit us at our next tradeshow for special pricing. Our next tradeshow will be Stitches West in Santa Clara, Ca. Sign up to our Mailing List to be informed of our webinar dates and specials. 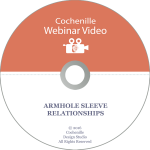 Attendees of our live webinars also receive additional savings on Cochenille products after the scheduled webinar. Join a webinar, learn something new about the software and save on your next Cochenille product purchase! Take a tour of Garment Designer with Susan Lazear as your tour guide! Susan will show you Garment Designer’s main attractions as well as help you discover destinations you may not have known existed. 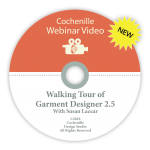 This tour will help seasoned travelers and new tourists explore Cochenille’s pattern making software. So join us and take a scenic stroll through Garment Designer’s menus, shortcuts and capabilities to help you gain a sense of direction when navigating our program! If you alter or create your own patterns, then it is time you increase your knowledge of pattern rules that professionals know and understand. In the class you will see how simple it can be…if you understand the basics. Study the anatomy of a pattern, learn how to change it properly and how to relate ease to fit. 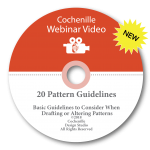 This is a great webinar to review or learn important patterning fundamentals. Garment Designer will be used to demonstrate examples. 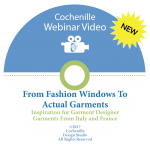 From Fashion Windows to Actual Garments webinar will take you through the process of analyzing the fashions you see in store windows, online or elsewhere and then building the pattern in Garment Designer. Learn some great Garment Designer and patterning tips and turn your next window shopping experience or Pinterest board into actual garments. A series of different garments will be shown and used in this workshop. You will learn how to interpret the styles and how to creatively use your software to make the pattern. 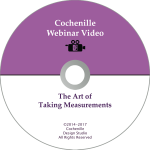 This webinar focuses on the art of taking measurements properly and accurately, for Garment Designer and general pattern making. It will also cover what part of the pattern ameasurement affects, and how better fit can be achieved, with the proper measurement in place. Are you a new Stitch Painter user? Maybe you need a refresher? This webinar will demonstrate the basic workings of Stitch Painter, Cochenille’s Stitch Design program. This program can also be used for Beading, Stitchery, Mosaics or any graph based design. Learn how to approach a project, use the Tools, Repeat, and other basic menus. This video includes 40 minutes of fashion trends overview and 30 minutes of demonstration of using Garment designer to build 4 garments, inspired by the fashions seen in Kyoto and Tokyo, Japan. Review current trends in Tokyo and Kyoto, Japan. See what is in the store windows and on the street. Then, using Garment Designer, learn how to build patterns for some of these garments. We will stretch your mind by choosing garments that are creative in their design and/or require a slightly different approach in Garment Designer. If you alter patterns, or want to draft them ‘from scratch’, Susan will teach you the basics of armhole and sleeve combinations. Understand how changes made to the armhole affect the sleeve and enjoy learning how to draft/create a multitude of sleeve styles. Garment Designer will be used to demonstrate examples.